Under the headline 'solving tea-mergencies since 1985' Direct Line insurance have launched http://www.teamergency.com - featuring Direct Line tea and the Direct Line Twitter account. Direct Line insurance are "now calling on those who are having a bad day - or are in the middle of a 'tea-mergency' – to use Twitter to tell them all about it. (@teamergency.) 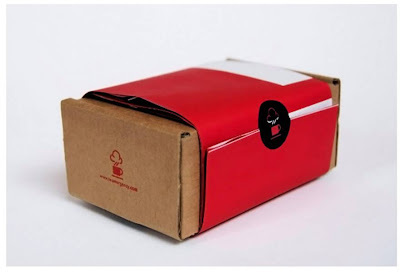 The best anecdotes will receive a free box of Tea-mergency Tea, which has been specially blended by Direct Line to help solve an everyday crisis. 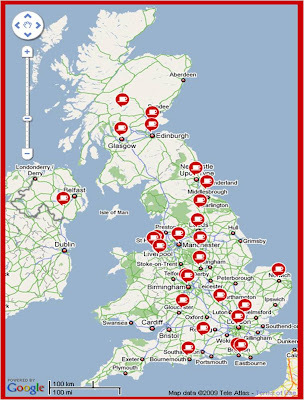 Direct Line is also monitoring all mentions of tea on Twitter, plotting the nation’s obsession with the drink on an interactive [Google] map on a new microsite." The whole Direct Line insurance tea project is framed with specially commissioned research that shows that 68% of people turn to tea in a dilemma. This is another example of an advertiser trying to drive conversation in order to raise brand awareness - and the interesting thing is that there are no links or no mentions of the Direct Line product on the tea-mergency microsite or the teamergency Twitter account. Campaign runs until the end of August. I think this is the weirdest and most naively executed strategy on Twitter. 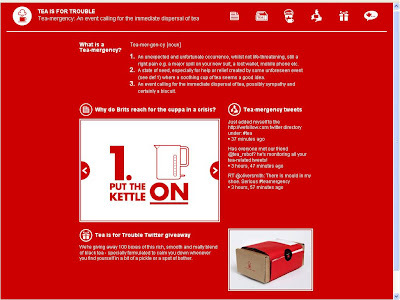 But first, somebody ask them to change that bright red background on their twitter page else I'll have a tea-mergency! agree with previous post - what on earth is this about? How has it got any link to direct line? Since when have they been about tea? Very odd. I'm still not sure I understand it either - especially the fact that there are no links into the Direct Line site, no mention of what Direct Line do and no reference to any of this tea stuff from anywhere on the Direct Line main site. I'm all for experimentation but I agree that this feels odd. I read somewhere, in the Daily Mail I think, that the campaign's all about 'exploring quintessential British responses to stress and anxiety' and that of these, 'reaching for the kettle was the most popular' - according to their research, this is true o 70%. Personally, I think it's quite fun. I saw some bloke on Channel 5 News last night demonstrating how to make the 'perfect' cuppa for trouble. For silly season, this campaign is rather good!